Delta thread-locking grades are designed to lock and seal threaded fasteners, corrosion and rusting is prevented. Loosening by vibration and shock is eliminated. Delta thread-sealing grades prevent leakage of gasses and liquids in both low and high pressure applications, they fill the space between threaded parts to provide an instant low pressure seal. Delta cyanoacrylates are one part adhesive which cure in the presence of atmospheric moisture (humidity). Before application of cyanoacrylate ensure surfaces are clean and dry. There are various products within the structural category such as Quick steel epoxy adhesive which is a 1:1 two component adhesive which cures rapidly at room temperature after mixing. It is a metal bonding adhesive which permanently bonds on a wide variety of metallic substrates such as :- all steels, aluminum, copper, brass, alloys, titanium etc. Quick Steel will also bond metals to other dissimilar substrates such as wood, stone, glass, plastics and ceramics. Another product is the Steel stick epoxy putty which is a non-rusting steel reinforced epoxy putty used to provide fast, permanent repairs to items made of ferrous metal or aluminum. It will repair holes, cracks and threads in castings, pipes and tools, it can be used to hold fixtures and signs, to make models and prototypes, to form nuts in situ and to lock threads. When cured it sets to a hard dark grey material that can be drilled, sanded, tapped, machined and filled as required. Deltas range of sealants & gaskets includes products for various applications. There Silicone sealants cure quickly by reaction with atmospheric moisture, gives a tough, durable and permanently flexible seal with excellent chemical resistance, waterproof and high electrical resistance. 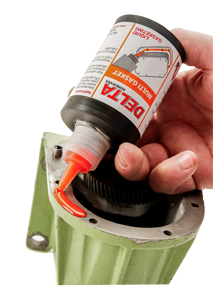 There gasket sealants differ with each application but the red gasket high temperature sealant is suited to industrial applications, cures quickly by reaction with atmospheric moisture, gives a tough, durable and permanently flexible seal and is resistant to transmission fluids, oils, gases, water and antifreeze.